This custom West Virginia Craftsman, built by our friends at Warfield Homes, features our timeless Rift and Quartered White Oak floors. The unique grain characteristics of our Rift and Quartered floors made this hardwood a wonderful choice for their clients, who desired both clean lines and a durable, long lasting floor. 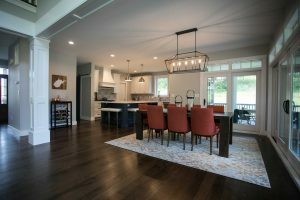 Professionally built by: Warfield Homes, Inc.
Flooring professionally installed by: Mike’s Custom Flooring, Inc.
Cochran’s Lumber is proud to be the leading provider of spectacular floors for homes, offices, and retail spaces across America! Visit our showroom to make the selection of flooring and finishes it’s both exciting and simple. We feature a variety of new and reclaimed flooring products and many new and unique finishes. 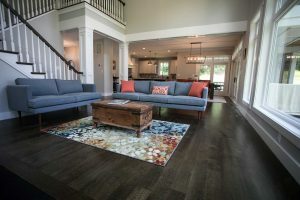 We are proud to offer an inviting space where customers can come and get a clear vision of the many types of hardwood flooring options that we offer, and feel comfortable at the same time. Visit our showroom today in historic Berryville, VA (only 50 miles west of Washington D.C) or give us a call at 1(877) 297-8331.